Overview - Odessa, 1905. Enraged with the deplorable conditions on board the armored cruiser Potemkin and raising the red flag of revolution, the sailors' revolt becomes the rallying point for a Russian populace ground under the boot hells of the Czar's Cossacks. When ruthless White Russian cavalry arrives to crush the rebellion on the sandstone Odessa Steps, the most famous and most quoted film sequence in cinema history is born. Editing is one of the basic tools of cinema. At times it can be used in a wholly functional manner, merely bridging one shot to the next without much in the way of artistic expression. In other instances, in the hands of a skilled filmmaker, the specific and carefully balanced succession and juxtaposition of images can be a director's most crucial device toward engendering an implication of meaning, tone, emotion, and mood. Though countless movies have added to and refined the art of film editing, in many ways none have been more influential than Sergei Eisenstein's 1925 silent film milestone, 'Battleship Potemkin'. Equal parts sweeping propaganda film and artful innovative experiment, Eisenstein's masterpiece is a treasured classic that is as potent and impressive today as it was over eighty years ago. The story chronicles a 1905 mutiny by a crew of mistreated sailors against their unjust and overbearing oppressors aboard the armored vessel, The Potemkin. The mutiny inspires the nearby seaport city of Odessa to rally in a similar revolution against the Czar's Cossacks. What follows is a tense explosion of triumphant spirit and violent repression. There is a remarkable simplicity to the story in both structure and content with little gray area, which is something typical of propaganda films of this nature. Good and evil are clearly defined and the filmmaker's agenda is always present, creating a fairly cut and dry account, which could have potentially made for a passive and banal experience. Thankfully though, through the marriage of incredible images, score, and sporadic intertitles, an extremely powerful narrative is woven. This potency is a direct result of Eisenstein's command of film editing, furthering his own ideas on what would become known as Soviet Montage Theory. The manner in which Eisenstein assembles his footage expertly constructs a visual rhythm with images. Cuts from one shot to the next are not made out of purely functional necessity, but instead take on a very specific and meaningful purpose. Pieces and fragments are spliced together at deliberate tempos to form a greater whole. The film is filled with instances like this, but one particular example comes when the city of Odessa rallies around a slain sailor. Eisenstein cuts to various shots of the townspeople mourning. At first the cuts are slow, lingering a bit on their solemn expressions. As the mourning starts to give way to anger, the cuts come quicker. Shouting starts in the crowd and close-up shots of fists clenching are mixed in as the pace of images builds and builds. The crowd's reaction grows more heated, the fists clench tighter and tighter, until finally shots of hands shaking violently in the air lead to an outburst of rebellion. The editing itself bolsters and actually creates emotion and meaning in a way that the mere content of the images themselves never could. Sequences throughout the movie elicit sympathy, anger, tension and symbolism directly as a result of how they are juxtaposed to the images that came before and after. Though this may all seem rather basic by today's standards, the complexity on display here was groundbreaking at the time as Eisenstein led the way toward contemporary film editing. 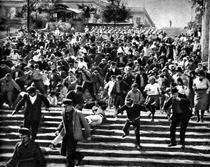 Much is made about the famous Odessa Steps sequence near the end of the film, and for good reason. Referenced in countless films since, including 'The Untouchables,' Woody Allen's 'Love and Death,' and of course 'Naked Gun 33 1/3: The Final Insult,' the scene is a true touchstone of cinema. It's a living breathing testament to the power of the cinematic ideas Eisenstein was experimenting with. The Odessa Steps sequence plays out like a minutely choreographed ballet of chaos. Rigid close-up shots of boots marching, wide shots of terrified citizens fleeing, and close-ups of faces filled with horror are all pieced on top of one another in a violent rally of imagery. Every cut is made with the intent of ramping up tension while increasing sympathy for the townspeople and anger toward the soldiers. Up until this point Eisenstein has kept the camera stationary, but in this sequence the camera begins to move, tracking with the fleeing people and their attackers. Since movement has been used so sparingly throughout the film, the tracking is made all the more powerful and meaningful. Though the scene itself depicts a rebellion being squashed, in reality the sequence is a loud rallying cry for an entirely different rebellion, a cinematic rebellion, that has been growing strong ever since. 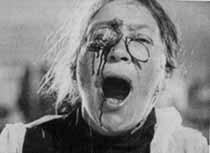 'Battleship Potemkin' is an ever enduring classic of cinema. It has survived a sordid history of censorship and arrives here in its most accurate and restored form since 1925. Though once radical enough to elicit bans, the story itself is simple but effective and the images and influential editing techniques take it to another level entirely. It is a testament to the still impressive methods of the silent era and is required viewing for any serious film fan and student of cinema. Presented with a 1080p/AVC MPEG-4 transfer in the 1.33:1 aspect ratio, 'Battleship Potemkin' looks fairly remarkable for a film of this age. The print does show frequent signs of damage with specks, dirt, scratches, and other reminders of age almost always in view. This is to be expected though, and never really hurts the presentation. A nice layer of grain is apparent throughout, giving the film a richly textured quality. The black and white image demonstrates mostly high contrast, though there are instances where scenes appear a bit faded, with blacks a hair too light. On the whole though, the transfer here is quite impressive. There is an incredible amount of detail and depth to the majority of the video that really demonstrates the strength of the Blu-ray format when it comes to presenting classic cinema. Some sequences come across as truly stunning, looking better here than they have for decades. Overall, the video transfer is wonderful. The only downfall here is the understandable and expected print damage, especially when considering the numerous sources this cut was cobbled from. With a movie this age, with such a troubled history, sometimes restorations can only go so far. That said, Kino has done a great job here, and the Odessa Steps sequence is breathtaking in 1080p! 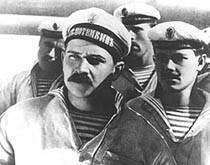 'Battleship Potemkin' is provided with an English 5.1 DTS-HD MA track featuring the original Edmund Meisal score as performed by the Deutsches Film Orchestra. Intertitles are provided in the original Russian with optional English subtitles, or in a newly translated completely English presentation. Being a silent film, there are of course no effects or dialogue to speak of, but the score itself is wonderful. Though mostly front loaded, the music does creep in from the surrounds as well. Dynamic range is good, with certain cues absolutely soaring with the images on screen. Bass even kicks in with some power during some of the more aggressive instrumentals. The only downside to the audio is some faint but surprisingly frequent pops and crackles in the soundtrack. At first I feared this was my equipment acting up with a possible loose connection, but I sampled the track on a completely different set up with different speakers and headphones and heard the same pops at the exact same moments. Thankfully, this minor technical hiccup is barely noticeable to most and doesn't detract much from the presentation. Photo Galleries - Three galleries showcasing twelve Behind the Scenes images, sixteen photos of Deleted Scenes, and eleven stills from Promotional Materials. Tracing the Battleship Potemkin (HD, 42 min) - Presented in 1080i with Dolby Digital stereo sound and hardcoded English subtitles, this is a fairly comprehensive look at the film's complicated history with censorship and restoration. Comparisons between the various cuts are included demonstrating the subtle but important differences. 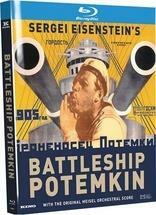 Sergei Eisenstein's 'Battleship Potemkin' is the very definition of a cinematic classic, if not a cinematic touchstone. The techniques and ideas present in the film are still being dissected and studied today. The video here is fantastic for a film of this age, and the newly recorded score provides an immersive and powerful experience. Extras are a bit slim, but the documentary is interesting. Overall, Kino has done a respectful job with this important release.